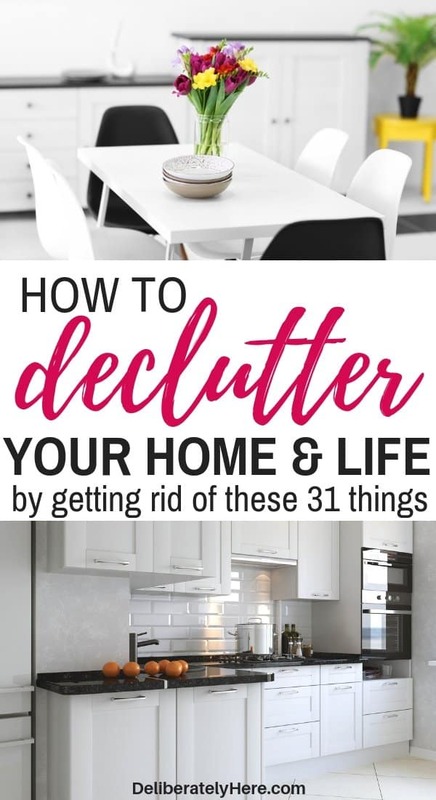 You’re determined to declutter your life and you’re jumping in with both feet – so you ended up here, reading a post about how to declutter your life by getting rid of 31 common things you probably have around your house. The first thing you need to know before you jump into decluttering is that this isn’t a once-and-done kind of deal, no matter how much you wish it was. The truth is, clutter constantly builds up. And it doesn’t stop building up until you do something about it (not once, but every day). Before I started this decluttering journey I used to think that if I went through our house with a couple of these bins on hand and sorted through everything we owned, that all of the sudden all of our clutter problems would be solved. Since I assumed that we only had to declutter our house once for all our clutter problems to go away, it wasn’t long before our house was filled with unnecessary things yet again. 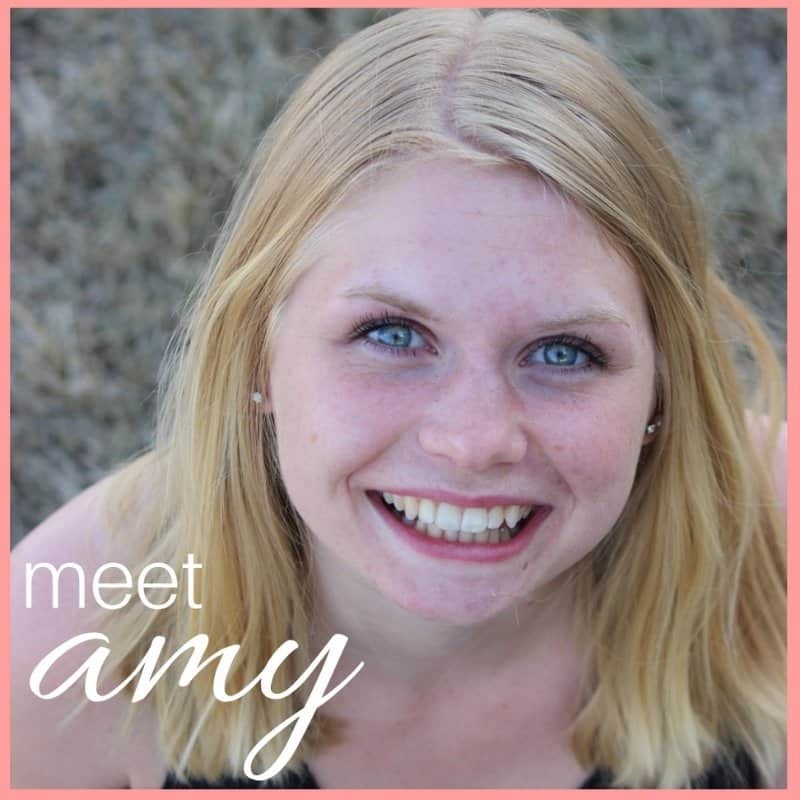 What I didn’t realize is that decluttering has to start in the mind – if I just decluttered our house then didn’t think about all the clutter I let back in, of course our house was going to end up cluttered again in no time. 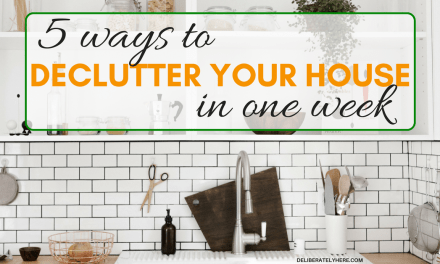 But, if I made a conscious decision every day about every item that we allowed into our house, that’s when I would finally be able to keep our home clutter free. Unfortunately purging your house isn’t enough to keep your life and home permanently decluttered. It will temporarily solve your clutter problems, but until you get to the root of the clutter, your house is going to straight back to its cluttered state week after week. I don’t know about you, but the thought of purging our house time and time again and only seeing temporary results sounds extremely exhausting and unappealing to me. Even if that was something I wanted to do week after week, it certainly isn’t something I have time for, and I’m sure you don’t, either. If you want to go even more in-depth to solve the clutter problem in your home, this free course will help you do just that. If you want to skip all this and get to the list of things to get rid of to declutter your life, click here. But, if you want to learn how to permanently change the way clutter affects your life, keep reading below. Most people are simply looking for a quick fix to their current problem, and I totally get wanting to fix something quickly. But, I’ve also learned over the years that there isn’t any permanent quick fix to clutter. Sure, you can temporarily fix your clutter problem and declutter your life by purging your house, but you’re going to have to purge your house time and time again as the clutter is just going to come right back – until you can start to realize where it’s coming from. If you truly want to fix your clutter problem, like with any problem, you can’t glaze over the surface and mask the problem with a cover-up. Instead, you have to dig deep and get to the root of the problem to truly find a solution. The root of your clutter problem may look significantly different from someone else’s, but I have learned from experience that the one most common reason people live cluttered lives is because they are afraid to let things go. Whether they feel an emotional attachment to something they have and couldn’t bear the thought of getting rid of that item, or they don’t have any attachment to it other than to keep it just in case they need it one day. The no-fluff solution to permanently decluttering your life is learning to say no. You have to learn to say no to yourself when you want to keep holding on to an item that you don’t need. You have to learn how to say no thank-you to people when they offer you things that would just add to the clutter in your house. You have to learn to say no to sales and bargains that you fear will never come around again. Learning how to politely say no – and how to let go of things – is your permanent solution to a clutter-free life. After you have purged your home, stopping the clutter before it has a chance to enter your house is exactly what you need to do to declutter your life – permanently. Now that you have learned what the solution to living a clutter-free life permanently is, let’s get on to the big list of clutter to get rid of and declutter from your life. While you’re going through this list of things to declutter from your life, make the decision to toss, donate, or sell each item you decide to get rid of. I find it helpful to have a couple of bins (these ones) on hand when decluttering our house to make the process faster. This way I throw everything I want to donate into a bin, everything I want to sell into a bin, and everything I will be throwing away into a bin. Some items will still be in tip-top condition and it would be a shame to throw them away, consider donating or selling these items so someone else can get some use out of them. Items that are broken or wouldn’t be of any use to other people should be thrown away. I would say cookbooks are a thing of the past, but I would be lying since I don’t fully believe that. With the internet, you have access to just about any recipe imaginable, but there’s something different to be able to read a recipe out of a physical book that you can hold and write in. But, it’s no lie that many people have an overabundance of cookbooks. You may have 20 cookbooks but only use 1-3 recipes out of each book. If that’s the case, rather than storing all these cookbooks, consider photocopying your favorite recipes out of the cookbook, and placing those recipes into a homemade cookbook. Only put recipes that you know you like (or would like to try) into this homemade cookbook. This way you can get rid of all your cookbooks and free up a bunch of space, but still keep your favorite recipes from them. Raise your hand if you have way too many mugs – more than you’ll ever need. I know you can’t see it, but both my hands are raised. As high as they can possibly go. I hate to admit it because I like to hold on to things, but my husband and I have way too many mugs. If it were up to him, we would have gotten rid of all of them but a set. But, I feel so attached to each and every mug that I have such a hard time parting with them. In the spirit of decluttering, I am taking it upon myself to go through our cupboard of mugs and finally get rid of the ones we really don’t need. If you’re anything like me and you have cupboards that are overflowing with coffee mugs, make a note of how many you would like to keep by thinking of what the maximum number of people you will have in your house at one time, drinking from coffee mugs, would be. Then, any mugs you have that go beyond that number have got to go. Trust me, I know it’s hard, but you will be pleased when you have that much more cupboard space to work with. If you have ketchup, mustard, and other condiment packets storing in your fridge and you don’t use them, it’s time to get rid of them. Since groceries are expensive and throwing food away is such a waste, you could open up each small ketchup packet and squirt them into your bigger ketchup bottle. The same goes for the rest of your condiment packets – open them up and store them all together so they actually get used up. Since we’re working on decluttering stuff from the kitchen already, add expired and spoiled food to your long list of things to declutter from your house. Quickly go through your fridge and find food that may have been shoved to the back of the fridge and is now spoiled. Also, go through your pantry and get rid of any food in there that is expired (but first check what it is – there is a surprising amount of food that can still be eaten past their expiry dates). Did you know that those spices sitting on the shelves of your pantry can actually lose their potency over time? Check the spices you are storing and make sure they’re still good and have lots of flavor left in them. If they don’t taste right, get rid of them. If you have a large collection of food storage containers, there’s a good chance that you have a select few that you reach for each time – leaving the rest to be stuck at the back of the cupboard and never get used. If that’s the case, throw all the food storage containers that you don’t need into a bin to donate so someone else that actually needs them can use them. You may also have a collection of empty sour cream and yogurt containers that you occasionally use as food storage containers. While I believe these work very well for storing food in, especially in the freezer, there is only so many you need. If you have too many, consider getting rid of all of them but a few (remember, if sour cream and yogurt are things you regularly buy, you will always have more of these containers available). Go through your kitchen cupboards and drawers and get rid of any serving utensils and dishes you don’t need. You may find you have duplicates of some things, donate one of these and keep one. 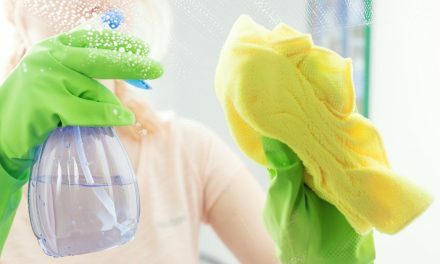 There’s no point in having more dishes and utensils than you will ever need – that’s just taking up more space and creating more work for you when you move or do a thorough deep clean of your house. 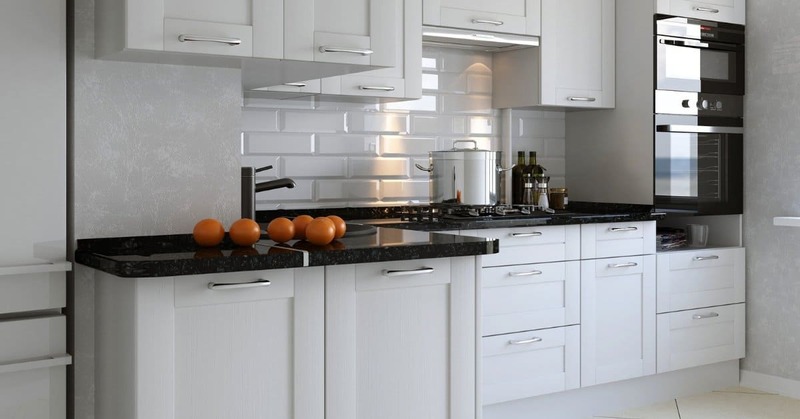 Before you leave the kitchen area, go through all your bakeware containers and get rid of any dishes you don’t need. If you can, find multiple uses for a single dish so you can eliminate the number of dishes that you have to store. Using these silicone cups to replace your muffin tins is a fantastic option to free up more space (they take up next to nothing for storage space), and can be used for muffins, cupcakes, in lunch boxes, and others. You went through most of your dishes already, now don’t forget to go through the kid’s dishes in your house, too. If you dig around in your movie box, there’s a good chance you’re going to find some that you haven’t watched in years. In fact, there’s probably a bunch that you completely forgot you had. Get rid of some old movies that you don’t plan on watching again. Treat yourself after you have finished purging your house to a family movie night to an old movie you forgot you ever had. Purge your CD drawer and get rid of any that don’t work anymore, or ones that you just won’t ever listen to again. Unless you only like to listen to music on CDs, there are so many different options for listening to music like on Youtube, Itunes, and other places on your computer and phone. Some of you aren’t going to be very happy with this item on the list to help you declutter your life – but even some books need to be decluttered from your home. I understand that books are a good thing to hold on to for your kids and grandkids, or in case you want to read them again in the future or lend them out to family and friends to read. While keeping books is a good idea, it isn’t a good idea to keep more than you can store. If you have a bookshelf that is absolutely overflowing and isn’t able to hold in all your books, you may want to look into different storage options, or into getting rid of some of your books. If you have any books you know you won’t be reading again, start with getting rid of those ones and see how much space that frees up. Any coloring and/or activity books that are completed can be tossed out, as you won’t be able to use them anymore. Rather than just holding on to them, get rid of these books and free up space for new activity books in the future. Do your kids have way more crayons and pencil crayons than they will ever need? Sort through the pile of crayons and pencil crayons and throw any away that are at the end of their life. I have talked about my obsession with collecting (free) pens before, and it bears noting again. Over time I have collected so many pens that our house now has a pen problem, and when I decided to declutter our house I struggled with getting rid of pens. I do a lot of writing, so I thought it was justifiable to have so many pens. It turns out it wasn’t – I could get rid of half the pens we had and still have enough to last us years. So, even if you don’t collect a bunch of pens or pencils, it’s worth taking some time going through the ones you do have in your house and testing them all – throwing away the ones that don’t work, and getting rid of even ones that do work, if you have too many. Do you have stacks of magazines lying around your house? If so, it’s time to get rid of them. Magazines are something you will likely flip through a time or two, but after that, they just become something that collects dust. One thing you can do if you particularly liked a certain article in a magazine, instead of keeping the whole magazine, rip the article out and keep it in a drawer or binder – somewhere you can easily find it for when you want to read it again. Raise your hand if you struggle to get rid of clothes. Yup, both my hands are way up there again. I used to have way too many clothes. Most of the clothes I had didn’t even fit me properly, or I didn’t wear at all because I didn’t like them, but I held on to them anyway. I have gotten so many hand-me-downs over the years, and I have always struggled to get rid of them. Even when they didn’t fit. I wanted to hold on to the clothes so I always had spares in case the ones I wore would get wrecked, or in case I went up or down a size in clothing. It wasn’t until recently that I was finally able to get ahold of my clothing hoarding problem and get rid of over half my closet. When my husband and I moved 3 times in 6 months, it forced me to realize that I didn’t even need over half of the clothes I was hauling around and holding on to. That’s the push I needed to finally be able to let go of my clothes. So – take it from me, that there’s a really good chance you don’t need all the clothes you have, and you will feel so much better when you cut down and simplify your wardrobe. If you struggle to get rid of clothes, consider having your husband help you go through and pick the clothes that you should keep or get rid of. If your husband isn’t up for that – or doesn’t have much of an opinion one way or the other – ask a friend to come help you purge your closet. It is so much easier to follow through with something when you have someone there keeping you accountable. The same thing goes for shoes. You generally don’t need more than a couple pairs of shoes – a fancier pair, an everyday pair, and then a summer/winter shoe – so take this opportunity to rid yourself of the extra shoes you have. If you hate to see them go, just know you are donating them to someone who will actually get good use out of them can have the shoes. Do you have more blankets and pillows in your house than you will ever have guests for a night? If so, donate extra blankets and pillows to free up space in your house and only keep the ones that you will use on a regular basis and for guests. Just like with the blankets and pillows in your house, if you have more sheets and pillowcases than you’ll ever need, donate the extra bedding and only keep what is essential. You may not want to hear this one, but while you’re working to declutter your life and you are decluttering your home, your jewelry also should be sorted through. You may be pleasantly surprised at a few pieces of jewelry that you love but forgot you had – pull those ones out and wear them. If you have more jewelry than you need, be sure to donate the one pieces that you don’t wear as often or at all. Go through your makeup stash and first, get rid of any expired products you have, then go ahead and toss (or give to a friend or family member) any makeup products that you don’t use. If you travel often there’s a good chance that you’ve collected a small stash of travel size shampoos and conditioners. Those small ones that you get at hotels and bring home but never seem to use. Either toss them or put them in your shower so they get used up rather than just taking up space in your bathroom cupboard. With the prices of plastic grocery bags rising, many people are switching to reusable grocery bags. If you don’t use reusable grocery bags and still get the plastic ones, or maybe you do use the reusable bags but forget to bring them to the store every time, there’s a good chance you have a large stash of plastic grocery bags kicking around your house. While I love my reusable grocery bags, I sometimes forget to bring them to the store. When that happens I have to pay for the plastic grocery bags, and, especially since I paid for them, I don’t like to let them go to waste so I use the bags to line small garbage cans throughout my house – but even still I seem to have many more than I need. If you, too, have more plastic grocery bags than you need in your house, get rid of most of them, hanging on to just a few if you use them for lining trash cans or other stuff. Do you tend to let your mail pile up throughout the weeks? With so many flyers and things we really don’t need coming in the mail, it’s easy for it to become out of control if you don’t stay on top of it every day. Sort through your mail and get rid of any pieces that you don’t need, then organize the important pieces of mail into folders so it’s not lying around your house everywhere. Use this nifty tool to keep your mail sorted. Like mail, receipts can pile up like crazy. If you are holding on to certain receipts for warranty purposes, create a folder in your filing cabinet for warranty-related items and important receipts. If you hold on to receipts of everything you buy for budget reasons, consider creating another folder in your filing cabinet for these receipts. Be sure you sort through them and throw any away that you no longer need so you don’t end up with years and years of receipts to sort through. Christmas, Easter, Thanksgiving, summer and any other decorations you have should be decorations that get used on a yearly basis. Since you will be storing the decorations that are out of season in a storage area, you will want to keep your decorations as minimalistic as possible so you have enough space for everything. Get rid of any decorations that you don’t absolutely love. If you don’t love it, there’s no point in putting it up in your house. Over the years I have collected a lot of candles, and while I love and use my candles on a regular basis, it doesn’t make sense to keep candles that I don’t particularly like or have a bunch of partially-used candles lying around. If you have candles around your house that you don’t use because you aren’t a fan of the scent, donate it. If you have multiple candles that are all partially used, consider melting them down and mixing similar scents together to create one candle. Sort through all the card and board games you own and get rid of any that are broken or missing pieces. If you can’t use it because of its missing pieces, there’s no use in keeping it. You can also donate any games that don’t get used regularly. Take a moment to get rid of any phone books that you have that are old or from a different place than you live. You can also get rid of any church directories that are old and ones that you have an updated version of. If you have a collection of notepads that have every page written on, rip out any important pages from the notepad and get rid of the remainder of it. If you can’t get any more use out of it, there’s no point in keeping it around. 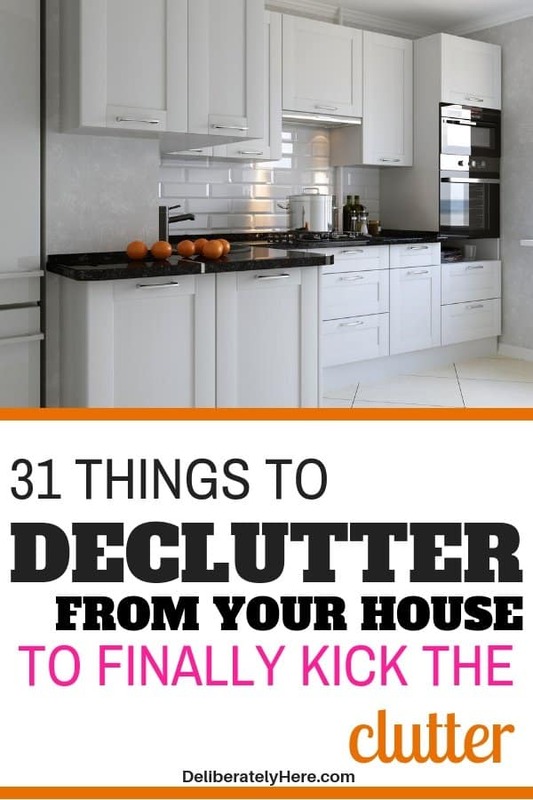 If this list of 31 things to declutter from your home to declutter your life sounds too practical and simple – that’s because it is. I’ll be the first to break it to you: decluttering isn’t complicated. It just requires effort from you. If you’re willing to put in the effort to declutter, it is so, so simple. Remember – decluttering your house once isn’t going to be a permanent fix, but rather a temporary mask. If you want to find the permanent fix to your clutter problems, click here. What are some of your favorite things to do to declutter your life? Are you an avid declutterer, or are you just starting out and learning how to declutter? What’s a decluttering tip that has stuck with you through your decluttering journey?